"In his passing, Reggie Grob did something immeasurable for the living." In 1962 two real heat related deaths in the SWC exposed the belief that water is for sissies as a fraud. It would forever change the dynamics of hydration at practice. 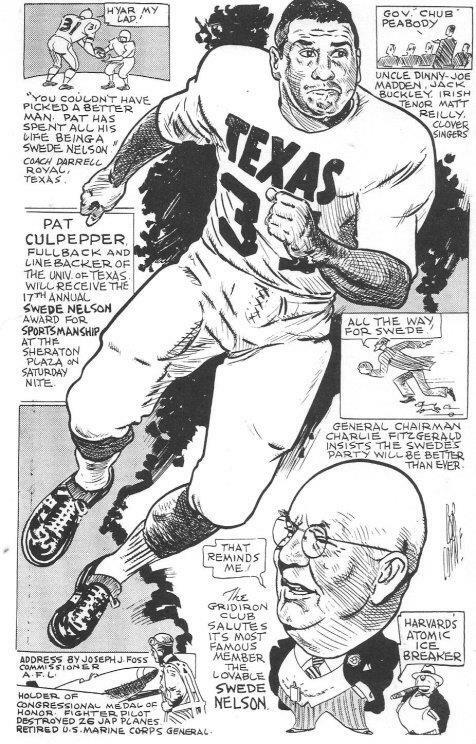 Pat Culpepper’s played ball for the Horns in the early 60’s and he wrote an Orange Blood thread about what happened in 1962 that finally exposed “water is for sissies” as an imposter. He says, “We (Longhorns) had come through two weeks of full pad practices in the Austin heat and humidity. There were water breaks for the first time because of heat problems around the Southwest Conference. In fact, we had five players taken to Breckenridge Hospital with heat dehydration. Only one never made it back - Reggie Grob from Houston. He died along with the senior captain from SMU, Mike Kelsey. Doctors thought the new plastic shoulder pads had something to do with the heat problems. Most of us wore expensive leather shoulder pads that actually got wet with our sweat which let some air through the jerseys while the plastic pads encased the player and did not allow any air. 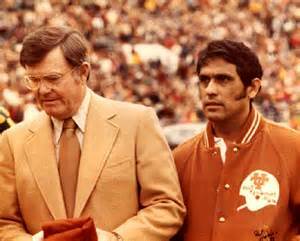 Before those youngsters died we never got water breaks, but our head coach Darrell Royal, as other coaches learned a tragic lesson. We went to Reggie's memorial service in Houston as a team in two buses on Monday of our first game. Pat is referring to the deaths of Mike Kelsey, the starting center for SMU and Reggie Grob from Texas who had heat stroke on the same day as Mike but who survived for 17 days before succumbing to liver and kidney failure. Reggie was 19 years old. At the time of Reggie’s passing only salt tablets were offered to reduce dehydration during practice. According to Jones Ramsey (Sports Information Director) Coach Royal was devastated by Reggie’s death and “collapses and cries” in the huge arms of Defensive Line Coach Charley Shria. Bill Little said about Reggie " In a very real sense, his death meant that thousands and thousands have lived. Out of tragedy, he gave us all a gift. And that's why he's a legend". Juan Conde says "I was already working as assistant equipment manager when Reggie passed away from heat exhaustion. I also recall Frank Medina tending him vigorously and the arrival of the ambulance. This incident took place at the old practice field across the creek and across from memorial stadium where practices were held. Coach Royal took Reggie’s death very hard." The death of Reggie and Mike was a wake up call for all who are associated with sports. Doctors, led by the American Medical Association, began immediate research on the effects of heat on the human body. Within a year, Universities mandated more liquids be served to athletes during work-outs and games. At the high school changes were slower. Some states were proactive and moved quickly to change workout routines. State athletic associations and individual school districts mandated limited practices during certain times of day, and practice days without full pads so that athletes could acclimate to the weather. Other states struggled to make changes to protect athletes. As of 2018 one state representative is still struggling to pass a bill that would require head coaches and assistant coaches of interscholastic or intramural sports to complete an education course on heat-related medical issues that could arise from a student athlete's training. In 2009 a Kentucky coach faced reckless homicide and wanton-endangerment charges in connection with 15-year-old heat related death. It was alleged that his players were in full gear, and several of them were denied water and told to keep running wind sprints -- called "gassers" -- in 94 degree heat, even after vomiting. It was learned that the boy who died was taking amphetamine Adderall for an attention deficit disorder which affects the body's ability to thermal regulate. The coach was acquitted by a jury in two hours, but yet another lesson was learned at the expense of a young boy. In 2011 two football players and one coach died after practise in scorching temperatures. See article on "Heat stroke" on this site for more information about Reggie Grob. EDITOR'S NOTE: The following is from the Longhorn Legends series recorded for use during halftime of Texas football games. The legend of Reggie Grob was highlighted at the Culligan Holiday Bowl game against Oregon. In light of recent tragedies at the University of Florida and with the Minnesota Vikings, it is a timely reflection. When they measure contributions to the game of football, the name of Reggie Grob won't mean much to a lot of people. However, what he meant to the game cannot be measured in tackles or yards. It is considerably more than that. Just before Texas played Oregon to open the 1962 season, Reggie Grob gave his life for the game he loved, and in doing so, he saved a lot of young people. This is his story. The phone call came to the practice field in late September 1962, and Darrell Royal took it hard, even though deep in his heart he knew it was coming. For 17 days, he - along with his team and football fans across the country - had prayed it wouldn't end this way. It was a hot, humid day when the fall practice had begun on Saturday, Sept. 1, and the team worked especially hard, since Sunday was always a day off. Reggie Grob was an offensive lineman from Houston Spring Branch, who came to Texas without a scholarship and played as a reserve on the freshman team of 1961. He had a fine spring training and worked extremely hard during the summer. He had a chance to make the team. We'll never know what happened in Texas that first day of September 1962. At SMU, starting center Mike Kelsey was taken from the practice field with heat exhaustion, and Grob and two other Texas players were hospitalized in Austin. The heat had hit players before. It was a ritual of the fall. This time, however, it was different. Mike Kelsey died that day. Two Texas players survived the scare with limited effects, but Reggie Grob, who thought he would be fighting to make the team, was suddenly fighting for his life. For 17 days, doctors marvelled as he used every ounce of the strength of a young athlete to battle kidney and liver failure that resulted from the heat stroke. Four days before Texas was to open the season against a good Oregon team led by Mel Renfro, Reggie Grob died. He was only 19 years old. On a Friday afternoon the day before the opening game, Darrell Royal put his team on buses to go to a hotel just as he always did. However, there was a detour. While Oregon worked out in Memorial Stadium, the Texas team drove to Houston for the funeral of Reggie Grob. For the family of a young man who died too soon, it is a sad and tragic story. The loss of a son is something you never recover from. In his passing, Reggie Grob did something immeasurable for the living. Every football program, no make that every athlete or wanna-be athlete, learned something the day Reggie Grob died. Trainers and doctors, led by the American Medical Association, began immediate research on the effects of heat on the human body. Within a year, practice routines were strictly governed by schools throughout the country, and every single person who ever played a sport, jogged or even thought about it, knew of the dangers of heat exhaustion. Texas did beat Oregon in a tough game that next day, but it really didn't matter. That's in the record book. It was Reggie Grob who mattered. In a very real sense, his death meant that thousands and thousands have lived. Out of tragedy, he gave us all a gift. And that's why he's a legend.